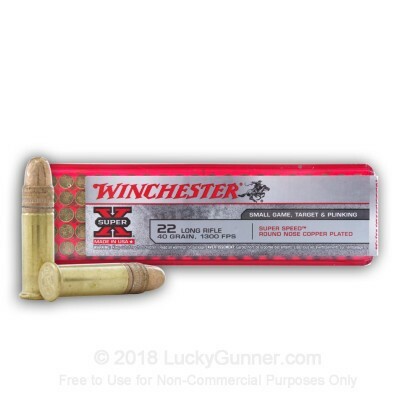 Winchester's Super-X line of 22 LR is one step in quality higher than the value line that you are most used to. This ammo is designed to yield proven accuracy, sure function, and reliability. Buy 500 round and save today! This high velocity 1330 fps cartridge is loaded with a 40 gr copper plated round nose projectile designed for small game and target use. If you prefer a fun day at the range, this is a great round for plinking or a friendly bet to determine who buys dinner. This ammo is brass cased, boxer-primed, non-corrosive, and rimfire primed. 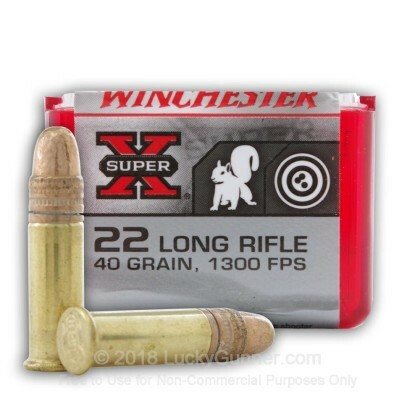 We also have this 22 LR - 40 gr CPRN - High Velocity - Winchester Super-X - 100 Rounds ammo in stock in a smaller quantity.